If you’ve ever gone on Instagram and found yourself overwhelmed by countless posts of people living it up in the sunshine and blanketing their captions with endless hashtags, and then deciding that they were nothing more than vapid and shallow attention-seekers, then boy is there a movie out there right now that thinks the exact same thing. Ingrid Goes West is kind of like The Cable Guy for the iPhone generation, and just like that film it offers a dark and satirical look at the world which we think we know but once opened up, in both cases thanks to a seriously deranged individual, we are far more put off by it than the actual insane person. It is a devilishly telling movie about the lives that social media personalities tend to live, and how so many filters have been placed over it that the truth is hardly recognisable and in its place is something much hollower. That, and it’s also creepily entertaining as a movie in its own right. The movie centres on Ingrid (a never-better Aubrey Plaza), a woman with serious mental health problems who has a dangerous habit of stalking people online, to a point where – in the first scene of the movie – she crashes the wedding of someone who merely commented on one of her posts and pepper-sprays them in the face in retaliation for not inviting them. She quickly moves on from that, however, when she learns about Taylor Sloane (Elizabeth Olsen), an influential Instagram personality who quickly becomes Ingrid’s latest obsession. Using the money left to her from her deceased mother, she moves to Venice Beach and slowly begins to insert herself into Taylor’s life – by ways of first kidnapping her dog and then returning it to her when missing posters appear – eventually becoming friends with her and her husband Ezra (Wyatt Russell). Things begin to fall apart, however, with both the unwanted intrusion of Taylor’s drug-addled brother Nicky (Billy Magnussen) and her growing feelings for her Batman-obsessed landlord Dan (O’Shea Jackson Jr.), but most of all her own damaging psyche. Ingrid is one of those characters who you know you’re not supposed to like, least of all because she is a crazed stalker hell-bent on being someone’s friend whether they like it or not, but seeing how she is also one of those people who cannot seem to live without her phone or social media, she’s also a tragic figure. In the film’s opening scenes, we see that she is constantly glued to her phone whilst doing almost anything, whether she’s in the bath or on the toilet or sitting on her sofa watching television, with the tapping sound of an iPhone keyboard dominating her every last breath. Even when she is involved in a serious incident, her very first instinctive is to ask about the well-being of her phone; that’s how addicted to the world of her smartphone she appears to be, and it has definitely not helped her mental well-being in any way shape or form. She represents an interesting commentary on the effect of social media on young people, particularly those without a filter to help them function in the real world; and when you read articles about teenage girls having low self-esteem because of the selfies they take and upload to Facebook, Instagram etc, you know how dangerous it can be to a young person’s sense of self-worth, and when that person is an already deranged stalker, it can start to have serious consequences for themselves and those around them. Even scarier, however, is how frightfully accurate it seems to represent those with actual influence on social media, and how they can seem to be even more dangerous than its lead character. Taylor is an intentional stereotype of the airheaded valley girl who, like Ingrid, seems to revolve her life around what she posts on Instagram, and fills her life with the sort of obscure items and pieces of literature that would make the average hipster come in their jeans. Immediately upon actually getting to know her, though, it’s abundantly clear that everything about her is an utter façade, and that she is actually an even bigger monster in how she controls everything in her life just so it can look good on her social media accounts – one scene where she asks a guy to lay in the dirt just so he can take the perfect picture of her and Ingrid is hilariously degrading and telling of how dangerous her narcissism can be – which is broadened by how perfect Olsen is in this role, since she takes the character’s hollow nature and makes it seem all too natural, sometimes even creepily so. If Ingrid is the person we don’t want to be but secretly are, then Taylor Soane is the person we aspire to be but really shouldn’t because there’s far better role models to fixate on. It’s a sly and often hilariously dark cautionary tale about the dangers of letting social media taking over your life, told from two very different but also very similar sides of the argument, and it is well written enough to actually justify some of its nastier moments, making it a smart and scary commentary on where our current obsessions with the digital age are leading us, and it ain’t pretty. 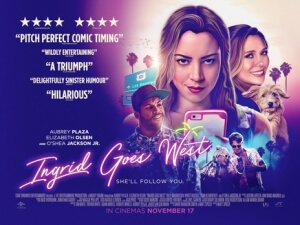 Ingrid Goes West is a sly and smart social commentary on people’s unhealthy obsession with social media, and how it can be damaging if used the wrong way, and sometimes even more so if used the right way.